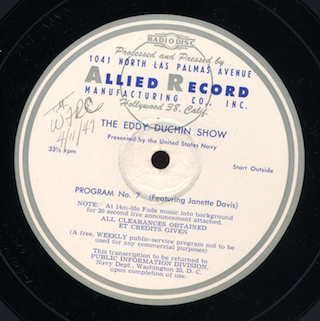 Here's the last program of our series, "The Eddy Duchin Show", a musical quarter-hour produced in the late 1940s for the Navy Reserve. Program 13 features guest Connie Boswell. The songs include "Lover", "These are the Things I Love" (sung by Johnny Mercer), "Martha" (sung by Connie Boswell), and "Say It Isn't So". 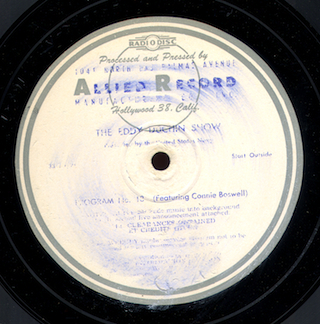 The show was transferred from an original vinyl Allied Radio transcription, matrix D-35868 FS-ABC-ND-168-1. 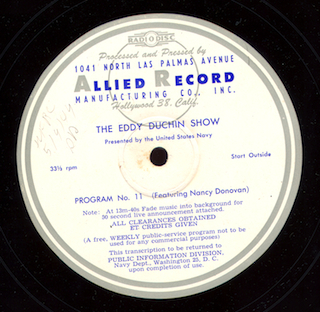 Here's the next to last episode in our short run of "The Eddy Duchin Show", a public service program for US Navy Recruiting dating from the late 1940s. Program 12 features guest Jane Pickins and is a tribute to the Submarine Reserves. The songs are "Hallelujah", "Limehouse Blues/Avalon/Honeysuckle Rose", "I'll Be Seeing You" (Jane Pickins), and "More Than You Know". The show was digitized directly from an original vinyl Allied Radio transcription, matrix D-355681R FS-AB-ND-154-1. We're almost at the end of our run of the 13 episode series, "The Eddy Duchin Show", produced for Navy Recruiting in the late 1940s. Program 11 in the series features guest Nancy Donovan and the songs include "Who", a medly of My Blue Heaven/Somebody Loves Me/Crazy Rhythm", "If You Are But a Dream" (Nancy Donovan), and "All The Things You Are". The show was digitized from an Allied Radio transcription, matrix D-35645 FS-ABC-ND-153-1. I had a bit of a goof last week and accidentally uploaded program 10 in the series. Here's the program you were supposed to hear last week. Program 9 in Eddy Duchin's public service show for Navy Recruiting features Yvette and is dedicated to Navy Chaplins. Songs on the show are "Shine On Harvest Moon", a medley of "Just One of Those Things/Alexander's Ragtime Band", "Too Marvelous for Words" sung by Yvette, and "With a Song in My Heart". The show was dubbed to digital direct from an Allied Radio transcription, matrix D-35647 F6-ABC-ND-155-1. Update, 11/15: Ooops. I had the show I originally uploaded as program 9. This is actually program 10, so I'm updating the post with the description for program 10 and uploading program 9 next week. Sorry about that! If you download the show with the incorrect episode number in the file name, please change it. 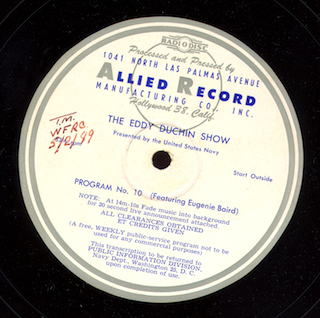 The next episode in our run of "The Eddy Duchin Show", syndicated in the late 1940s for Navy Recruiting, is program 10 with guest Eugenia Baird. The show is a tribute to Electronics Reserves Units. Songs in the episode are "Lady Be Good", "Beyond the Purple Hills" (Johnny Mercer), "Ain't Misbehavin'" (Baird), and "Stardust". The show was digitized from an original Allied Radio transcription D-35644 FS-ABC-ND-157-1. 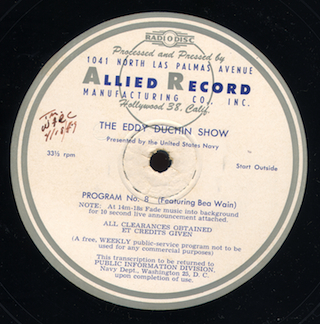 Guest Bea Wain drops by "The Eddy Duchin Show" in program 8 of this series produced for the US Navy. The songs include "Sometimes I'm Happy", Ain't Doin' Bad" (Tommy Mercer), "One for My Baby" (Bea Wain), and "Lovely to Look At". The program was digitized direct from an original Allied Radio transcription, matrix number D-35646 FS-ABC-ND-156-1. There's one of the blog listeners who is a big fan of Eddy Duchin. 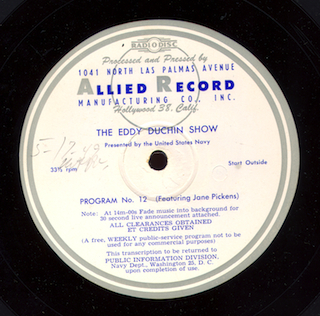 So, since we finished out "The Grantland Rice Story", I thought we'd run the remaining episodes I have of "The Eddy Duchin Show" that was produced for US Navy Recruiting in the late 1940s. Over the past couple of years, I've posted the first six shows in the series. "The Eddy Duchin Show" returns to the blog after a hiatus of a few months. I've got all thirteen shows in the series and will eventually work my way through them here for you Duchin fans. The series was produced for the Naval Reserve and was a good fit for Eddy Duchin, since he was a Navy vet. Program 6 in the series salutes the US Navy Dental Corps and the guest is Nan Wynn. Songs include "Nobody's Sweetheart", "Galway Bay" sung by Tommy Mercer, Nan Wynn's rendition of "The Man I Love" and Duchin and the band giving us "Why Do I Love You". The show was digitized from an original vinyl Allied Recording transcription, matrix number FS-ABC-ND-194-1. Eddy Duchin returns to the bandstand this week with Program 5 in the series he recorded for the Naval Reserve in the late 1940s. Our guest this week is Anita Ellis who sings "What is This Thing Called Love". Johnny Mercer gives us "On a Slow Boat to China" and Eddy kicks of the show with "Darktown Strutter's Ball". The program is a tribute to the Navy Nurse Corps. The transfer is direct from a vinyl Allied Radio transcription, matrix D-34786 ABC-ND-142-1. All hands on deck! 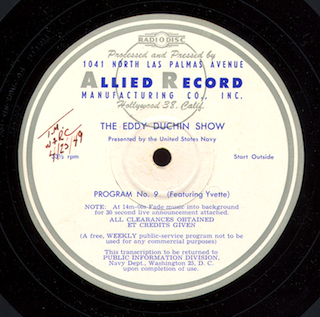 It's the "Eddy Duchin Show", a late 1940s syndicated public service show created for the Naval Reserve. In program 4 of the series, we hear guest Maxine Sullivan singing "Molly Malone". Duchin and the band perform "Sweet Sue", "Embraceable You" and a medley of "three old favorites. The show is a tribute to the Civil Engineering Corp, so we get to hear some info on how you can use your skills building things for the US Navy. The show was transferred from a vinyl Allied Radio transcription, matrix D-33998 FS-ABC-ND-140-1. There's a total of 13 shows in the series that I'll be posting over the next few months.